I figured it was high time to show you our updated laundry room! We hadn't planned to do some work on it for a few years, but it seemed like a perfect time when we were getting our "ancient" hot water heater replaced. Michael planned everything perfectly so that the hot water heater would be removed on Friday, and we could spend the weekend re-doing the floor and painting before the new hot water heater would be installed on Monday. It was an incredibly busy weekend, but well worth it because it's so nice to now do laundry in there! Say goodbye to yucky old hot water heater that was made in 1992. I was so glad to get rid of that icky brown/beige color combo. We also bid farewell to linoleum which was original to the 1976 home. It was a beast to rip out, then we spent hours scraping the old glue off the cement. I'm so glad that is over with! You can't really tell from these pictures, but there used to be huge shelves that partly covered the window and that we ripped out, knowing full well we would never put them back in. They just made the room feel incredibly small and cramped. There were also really cheaply made shelves on the other wall above the washer and dryer, which we also ripped out. You can see our new windows that were installed around the same time. We decided we like the laundry room without blinds, considering it's in the basement and we need the extra light more than privacy. We have plans to build wooden pedestals to put the washer/dryer on, and which will be a place to house laundry baskets. Also, we want to build a nice shelf above the washer and dryer for random detergent/cleaning storage. Add some baseboards plus a new light fixture, and we're golden. I know that the laundry room isn't completely finished, but I figured the huge transformation warranted a post, or else who knows when I would have posted about it?!? New hot water heater that works incredibly well and isn't filled with pounds and pounds of compacted sediment. I can now resume my ritual of taking a nice hot bath on Saturday nights. Yay! 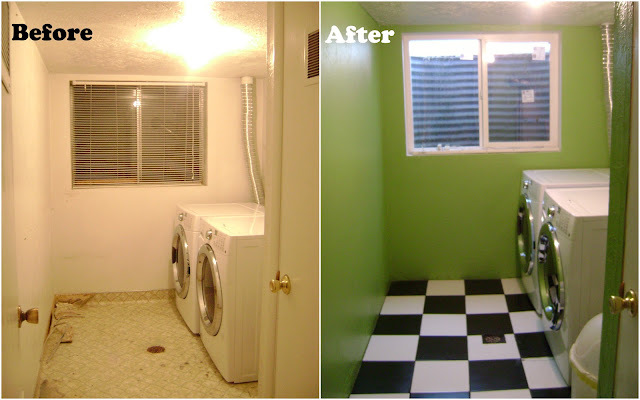 I LOVE black and white checkered tile floors and have been dreaming of a laundry room with them for years. Now my dream has come true! It's so nice that your washer/dryer open outward -- now you have a built in shelf! I would suggest putting some curtains up around the water heater so it's ugliness doesn't detract from your beautiful laundry room! But your choice :) Well done! Thanks Em! I never thought about putting curtains around the hot water heater. :) And we really love our washer and dryer. We got them half price at RC Willey and they were brand new! Yay! So cute! I love the floor and the bright color. I know it's silly - but I am most excited to decorate my laundry room of any in our whole house. Keep us posted on more updates of this room (and all your rooms!) I love to see things like this. Thanks Shantel! I thought of you as we were doing the laundry room and then when I saw your post about moving in to your home and notice that we have the same washer/dryer set, I was once again confirmed why we are friends! I love the room and it is so fun to be in. I can't wait to see more of your house...party soon? It looks great! And I wonder where you came up with that bright green? Lovely! Can't wait to see it in person. So glad you're getting your "house in order" just the way you want it. Love you! You know me, I LOVE green. I was originally going for quite a bit lighter, but it looked almost like a highlighter, so we went a couple shades darker. It's quite reminiscent of Devonshire in Logan. It's fun to do all the house stuff! The laundry room looks absolutely amazing after the remodel. Well done on hiding the heater and the floor is so cool looking. A real pleasant room now that you are done with it. I'm going to try convince my wife to do this with our scullery. Thank you for giving me some great ideas.